The penthouse inside New York City's landmarked One Hundred Barclay building is currently on the market for $59 million. With a 96-feet by 33-feet living room area, it boasts the largest living room in New York City. Its massive floor-to-ceiling windows make you feel like you're up in the clouds. The penthouse inside One Hundred Barclay is a stunning sight. Manhattan's Tribeca neighborhood is home to some of the most expensive real estate in the world — and now, it's also home to the largest living room in all of New York City inside the penthouse of the landmarked building at 100 Barclay Street, which borders Tribeca and the financial district. Measuring 96 feet by 33 feet, the great room that makes up much of the penthouse has majestic views of uptown. While peering downtown through its floor-to-ceiling windows, you can almost spot your own reflection on the glass of One World Trade. Altogether, the $59 million penthouse is 14,500-square-feet, and spans both the 32nd and 33rd floors. The luxury residences inside One Hundred Barclay have been under redevelopment by Magnum Real Estate Group and the CIM Group — who have worked carefully to preserve the building's rich history. Originally built as the headquarters for New York Telephone Company in the 1920s, the Barclay's building was designed by Ralph Walker and was the first Art Deco skyscraper. Its 6,000-square-foot lobby remains intact with the original 12 murals that depict the evolution of human communication by New York artist Hugo R.B. Newman. Ahead, a look at the incredible penthouse, which was imagined by interior designer Brad Ford, of Brad Ford ID. Listed by the Corcoran Group, the penthouse has an asking price of $59 million. The home has a perfect view of uptown and the Empire State Building. Massive industrial-style windows surround the entire living room area, and are up to 21 feet high — just a foot below the ceiling. The penthouse has the largest continuous art wall in any private home in New York City. Owners will be able to display works of museum scale, up to 65-feet wide by 22-feet tall. Located on both the 32nd and 33rd floors, the home has a staircase leading up to its second level in the living room. The upstairs area, which is over 6,000 square feet, has purposefully been left mostly untouched so that prospective buyers can customize the home to their preference. The layout potentials are endless. Up to seven bedrooms can be built out. A wine room connects the kitchen and living room and can hold up to 630 bottles. The kitchen has Calacatta Gold marble countertops and the dining area also has ample light. Out the south facing windows, the Barclay's building can be seen in the reflection of One World Trade, and the Statue of Liberty is just beyond. A small lounge area and wet bar is located near the kitchen. A dual-sided gas fireplace has also been installed. 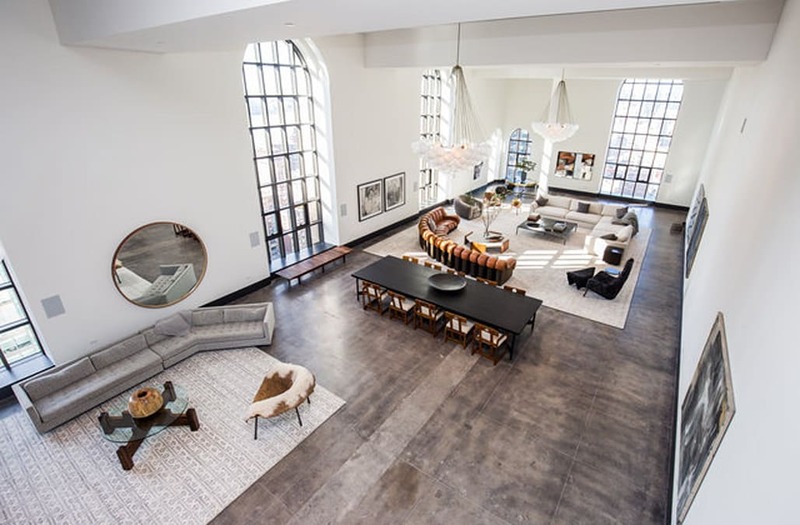 Spanning over 14,500 square feet with its own private elevator landing, this penthouse is truly majestic.